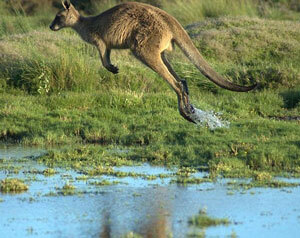 Feeling jumpy? It may not be from what you think. Researchers at Australia’s government-backed Centre of Excellence for Kangaroo Genomics have mapped the genetic code of these marsupials, and were surprised at the amazing similarity to that of humans. Looking at the huge outward differences between us and roos, it is obvious that the same gene must be able to make quite different proteins. The reports made no mention of the percentage similarity. It sounds like it would be extremely high—perhaps embarrassingly so, given that unlike chimps, kangaroos are not supposed to be our ‘close relatives’. Looking at the huge outward differences between us and roos, it is obvious that the same gene must be able to make quite different proteins. But then, that should already have been obvious from the fact that despite people having only about 20,000–25,000 genes,3 our bodies can make about 100,000 different proteins. Trounson, A., Micro view of macropods as kangaroo genome mapped, The Australian, <www.theaustralian.news.com.au/story/0,25197,24671699-27703,00.html>, 19 November 2008. Return to text. 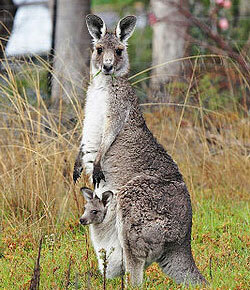 Kangaroo genes close to humans, Reuters, <www.reuters.com/article/scienceNews/idUSTRE4AH1P020081118>, 18 November 2008. Return to text. Although it could be many years before we know for sure just how many protein-coding genes we have. See How Many Genes Are in the Human Genome? <http://www.ornl.gov/sci/techresources/Human_Genome/faq/genenumber.shtml>; and increasingly it seems that the non-protein-coding DNA is more important. See Astonishing DNA complexity update Return to text. Jones, S., interviewed at the Australian Museum on The Science Show, broadcast on ABC radio, 12 January 2002, <www.abc.net.au/rn/science/ss/stories/s456478.htm>, 25 January 2002. Return to text.